For me it's Otherworld, Redwood and Sé. I like the others too but these are the ones I am most happy with. I will ask the lads what their favourites are but I think they are quite different. We talked about this recently as we are putting together a best of album and I remember that we had very different views. The reason I like Redwood is a combination of the tunes and also the playing. I have to say though that I was never that happy with the way the album was mixed and mastered and I think it suffered a bit because of this. For our forthcoming best of collection all the tracks have been remixed and remastered and the Redwood tracks especially have been given a new lease of life. We have recorded in both of these ways over the years but have found that when and where possible the all in one room and all together option is the best approach. The energy and interplay can only really happen when listening to each other and being aware of the collective sound. Over the years some of the studios have not had a large enough recording room to accommodate all five of us. It's not just a matter of space of course sonically it has to work too allowing us to play together without other instruments spilling or bleeding into other peoples mics. This is important when looking for good separation between the instruments at the mixing stage while also allowing a certain amount of scope for fixing the odd mistake hear or there. Some of the slower Lúnasa tunes would have been tracked with perhaps myself and Donogh or Paul playing together initially and the lads layering instruments and parts individually after that. The important aspect in all of this is setting a good foundation track. This has to have a good feel to it and convey the right message musically. If it's a slow piece it must feel right and if it’s an up tempo tune it has to have energy and drive to it. You can't build on something that hasn't a good foundation. What do I think of Lúnasa? I don't think about them! As for Lúnasa what I’ve heard I really like! Q. 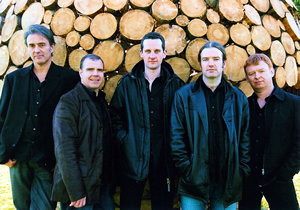 What do you think of bands like Horslips, In Tua Nua, Moving Hearts, The Pogues, The Waterboys, Kila and Lúnasa? A. I'm more into bands like Planxty, Bothy Band, Moving Hearts, and De Danann and I played with Lúnasa so.. But I appreciate all the bands above! Trevor's a really good friend so better be careful! No they are incredible musicians and I really enjoy their concerts, and I love their debut record. Never heard anything of Lúnasa. Interviewed them once many moons ago but am not familiar enough to make a comment on them. Lúnasa are great. Real power house of players and sound. Been a fan especially of Sean Smyth’s playing for a long time. Haven’t seen them for a few years - more trad, less fusion- they were brilliant live in the ‘Moloney After Midnight’ studio back in the day. I don't know Lúnasa's music. In relation to Lá Nua I'd have to say that overall I'm really happy with it but as always there are little things that I'd love to revisit and touch up here and there. It's a very sincere and mature recording I feel and we gave our heart and soul to every track. I'm very proud of the self composed pieces within the band, Cillian especially has really come of age in this respect and his tunes are among the best we've ever had to work with. I haven't heard enough of Lúnasa to comment. Both of these have come up for discussion many times but so far we've resisted the temptation. I'm not saying it won't happen though but for now it's not a runner. The album with a number of singers even got to the stage of making a short list which consisted of Iarla O'Lionaird, Christy Moore, Karan Casey, Natalie Merchant, Mike Scott, Don Stiffe, Tim O'Brien, John Spillane and Roisin Chambers. Give us a couple of years and this one will probably come to life. To me, Lunasa represent the melodic side of trad. The harmonies and the verve in their playing elevates them to premier status.